It is a town which may be accessed by land, rail and even air. Selçuk is one of the historical, cultural and touristic capitals of our country. It receives most of the tourists from the cruise ships which berth in the neighbouring ports, i.e. from the sea. It occupies a distinguished place in the world for the cultural assets it possesses, the ancient town of Ephesus being pre-eminent. As we have found out in the archaeological research carried out in the recent years, the very first settlements at Selçuk go back some 8.000 years from the present. Çukuriçi and Arvalya mounds represent the Western Anatolia prehistory in our town. Of these mounds, the excavations recommenced at the Çukuriçi Mound show that this settlement dates back to the Early Calcolithic Age for the time being. As we approach the present day, we see the continuation of the settlement in our town at the Ayasuluk Hill in the town centre. In the second millennium BC, we encounter a settlement dated to the Late Bronze Age here: Apasa! Established on the Ayasuluk Hill, Apasa was the capital of the Luwian Kingdom. The Luwian Kingdom dominated a great part of Anatolia from the 16th century to the 13th century BC. Also during that period, we encounter a king’s name for the first time. Great King Tarhuntadaru! The Luwian Kingdom reached its largest territories during the reign of Tarhuntadaru. Once the Hittite Kingdom gained ground in the Central Anatolia, the Great Hittite King Murshili II started a campaign against the west and defeated Arzawa in 1315 BC and made it a vassal state. In the 11th century BC, i.e. Iron Age, migrations started to Anatolia from the North. Prince Androcles, son of Codrus, legendary king of Attica, and legendary founder of Ephesus, also arrived at Ephesus and took over the town from its native Carians, Lelegians and Lydians. In this period, the town centre was still on the Ayasuluk Hill. The earliest findings date back to the Late Bronze Age in and around the Temple of Artemis, which is situated on the western slope of the Ayasuluk Hill. The area served this faith which is the predecessor of Artemis as from the early Iron Age (late 11th century BC) at the latest. One sees a revival and a significant increase of population in the area in the 8th century BC. In this period, an example of settlements in the form of a small village has been found under the Commercial Agora that we see today and excavated. Some findings belonging to contemporary settlements have also been unearthed in the area called Coressus to the north of the Panayır Hill. The initial findings in the vicinity of the Temple of Artemis on the western slopes of the Ayasuluk Hill, which later became one of the seven wonders of the world, are dated back to the 8th century BC. In this period, the people must be living on the slopes of the hill and around the temple. Herodotus the Historian reports that the Lydian King Croisus conquered Ephesus once he succeeded to the throne in 560 BC and gathered the people who lived in a scattered manner here and urged them to settle around the Artemission. The columns presented to the Temple of Artemis, which was built in the period, by Croisus and the architectural features of the building occupies a special place as a cornerstone in archaeology and architecture. The Lydian rule lasted short and Ephesus came under the rule of the Achamenid King Cyrus in 546 BC. The Persian rule continued in Ephesus until 334 BC, i.e. until the arrival of Alexander the Great. Having taken over the control of the area after the death of Alexander the Great, Lysimachus took a step which would have a radical effect on the history and development of the town. He decided to move the town to its present location between the Bülbül (Pion) and Panayır (Coressus) hills. Most important of all, he changed the name of the town and named it after his wife: Arsinoeia! The most important reason for the change of place of the town was that the alluvium and flood brought by the river Caistrus (Küçük Menderes) river and Marnas (Derbent) stream turned the plain and the environs of the archaic town into a swamp. The harbour of the town did not function. The new town was established in the gridiron plan in which the main avenues were intersected at right angles by side streets and which was improved by the Milesian architect Hippodamus between the Bülbül and Panayır hills. It was surrounded all around by walls. Lysimachus caused the theatre, state agora, commercial agora, prytaneion (town hall) and stadium to be built as the major buildings of the town. Thus, he aimed at convincing the people to move from the vicinity of the temple of Artemis to the new town. Further, the State model which had been established by small towns by this period which was called the Hellenistic Period had left its place to the States which scattered over large areas. Of course, the name of Arsinoeia did not survive longer than Lysimachus. Ephesus rapidly developed in its new location. Local merchants turned the town a trading centre in the true sense of the term. The Commercial Agora of Ephesus was now a centre where those goods brought from Anatolia by caravans and those goods brought to the harbour by vessels were exchanged. The people and the town got rich. The town was adorned with governmental buildings, monuments and richly decorated mansions. In particular, the town gained its most magnificent appearance during the reigns of the emperors Trajan and Hadrian in the 2nd century AD. In this period, the town was the capital of the Asian province of the Roman Empire and its harbour the port of entry to Anatolia for the Roman officials. Even after the Emperor Diocletian (AD 284-305) re-organised the Roman Empire, the town of Ephesus remained the seat of the provincial governor (Proconsul Asiae) and a political centre as well. A number of earthquake disasters caused an economic collapse in the middle of the 4th century and it took time for the town to revive. At last, losses were overcome with donations from the empire and with tax exemptions and the economic welfare which the town had once possessed was re-established. This situation shows up in a great many buildings which went under restoration and were re-built: Upon the religious edicts of Theodosius I (particularly, the fact that Christianity was declared the official religion of the Empire in AD 391), the construction of magnificent churches caused substantial changes in the appearance of the town. The Roman Portico where the third Council gathered in AD 431 and such important decisions as Mary’s consecration as “Theotochus” (Mother of the God), which were so important for the future of the Christian world kept surviving as the very first church which was named after the Virgin Mary through some alterations carried out inside the building. As from the 6th century AD at the latest, a settlements surrounded by walls developed around the Basilica of St John, which was considered to be one of the prominent centres of pilgrimage of the Byzantine Era on the Hagios Theologos (Ayasuluk/modern Selçuk) hill at a distance of 2,5 kilometres. Despite the harbour was silted up and its vicinity turned to a marshland as the condition of the Empire became more and more insecure, this new town where the seat of the archbishop had been moved as from the 7th century enjoyed a rapid growth. As well as the re-building of the city walls of the Byzantine Era surrounding the remnants of the town of Ephesus in the 6th and 7th centuries, the fact that the town was promoted to the seat of the Thracesion which was the new administrative unit (Thema) shows that this metropolitan town did not completely lose its former superiority. Positioning of a legion (military unit) in the town became a necessity when one considers the expansionist efforts of the Arab world: In this way, Ephesus was pillaged in around 654-55 by Muawwiya the Governor of Syria, and in around 715-16 by the Arabian Admiral Maslama on their way back from the siege of Constantinople which had been proved unsuccessful. 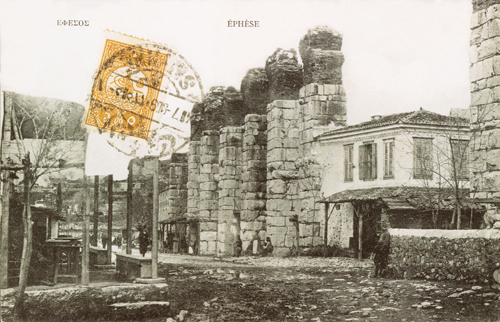 In the ancient sources, Ephesus is described as the biggest reinforced town of the Thema Thracesion even in the first half of the 9th century. Ephesus lost its political and military superiority to Samos in AD 890 and to Smyrna (İzmir) immediately afterwards. This must not lead any one to consider that the town was definitely deserted: even though very rare, archaeological evidence shows that Ephesus maintained its status of a distinguished town until far into the 13th century although the local administration had been on the Hagios Theologos (Ayasuluk) for a few century. Ten years after the Mankiert Battle (1071), we witness the very first Turkish settlements at İzmir and Selçuk. In 1081, Çaka Bey managed to arrive at the İzmir region and to gather the Turks together, thus establishing a coastal princedom. It is known from several sources that there were Byzantine and Catalan invasions later. Although the Seljuk prince Tengribirmiş conquered Ephesus and the Hagios Theologos (Ayasuluk) in 1090, they were taken back after a battle which took place not far from the Hagios Theologos hill in 1096 by the Byzantine General Johannes Ducas. The final conquest of Ephesus-Ayasuluk was achieved in 1304 by Aydınoğlu Mehmet Bey. Although Ayasuluk passed to the Turkish hands, the Byzantine church organisation was not greatly damaged. Once the province of Aydın was conquered, Gazi Mehmet Bey made Birgi his capital. He divided the places under his sovereignty into five regions and appointed his sons as princes in such regions. Of his sons, Mehmet Bey was the prince of Ayasuluk and Sultanhisar. There is detailed and interesting information about the commercial condition of Ayasuluk during the period of Aydınoğulları. After the Port of Ayasuluk passed to the control of the Turks, it was one of the prominent trade centres and most important wharfs of the Eastern Mediterranean. The navy built at the shipyards of Ayasuluk and İzmir sailed into the Black Sea and a war campaign was organised over Eflak (Wallachia). The fact that there were 300 ships in Umur Bey’s campaign to Greece in 1333 shows how developed the shipping was. The naval campaigns organised over the Aegean Islands, Mora (Peloponnessus), Thrace and the Black Sea by Aydınoğlu Umur Bey made the Byzantines extremely worried. Western merchants brought fabrics, objects made of silver, wine and soap to and took Kütahya wine, wheat, rice, wax and unspun hemp from Ayasuluk. Basing on such economic and commercial development, Ayasuluk became an important cultural and artistic centre. Princes of Aydınoğulları highly respected scientists and helped the intellectual movements to improve in that period. Şehabettin Sivasi, whose shrine is located in downtown Selcuk today, is one of those scientists. During this period, translations were made from Arabic to Persian, dedicated to İsa Bey. Another example of Aydınoğlu İsa Bey’s good attitude toward and sponsorship of the scientists is the gracious attitude toward the scientist grandfather of the Byzantine Historian Ducas, who had escaped Byzantine Empire and took refuge with him although he was not a Muslim. It is know that the relationships between the Ottoman State and the Aydınoğulları Princedom were very amicable in the beginning. Once he established security in Thrace and solved the fights for throne in the Byzantine Empire in the way he desired, Yıldırım Beyazıt passed to Anatolia. In a campaign organised in the winter of 1389–1390, he annexed the Aydınoğulları Princedom to the Ottoman territories. İsa Bey was allowed to stay on Ayasuluk on his own will. It is known from the written sources that despite the management of the foundations was left to İsa Bey, sermon was given and coins minted in the name of Yıldırım Beyazıt. Tamerlane put the whole of Anatolia under his sovereignty and arrived in the province of Aydın and used Ayasuluk as his base after the Ankara Battle (1402). Having stayed at Ayasuluk for thirty days, he grasped all of the fortresses, cities and towns in the vicinity. Then he trod towards Milas. When Tamerlane gave the province of Aydın to Musa and Umur II, sons of İsa Bey, Cüneyd and his brother Hasan, both of the same dynasty, started to claim rights. At last, Cüneyd became the sovereign of İzmir and Hasan of Ayasuluk. Upon the death of Umur Bey in 1405, Cüneyd Bey became the sole sovereign of the princedom. It is found out that in 1426, when Murad II annexed the provinces of Saruhan and Hamid to the Ottoman territories, Ayasuluk and Tire also entered the Ottoman rule once again. In the 15th century, Ayasuluk was a crowded town which was comprised of sixteen quarters, where Muslim and Christian people lived together. The development of the ports of İzmir and Kuşadası after the 16th century was effective in the fall of Ayasuluk. The people of Şirince, which was a municipality in that period, performed agriculture and animal husbandry in the territories of Ayasuluk, which could not go farther than being an outpost under the Sancak of Aydın in the Ottoman Period. From some photographs dating back to the second half of the 19th century, we know that Turkmen Yürüks lived in small groups on the Ayasuluk hill and its environs. Construction of the İzmir-Aydın railroad, which the very first railroad line in Anatolia, started in 1856. The Ayasuluk station which was put into service on this line in 1867 started to revive Ayasuluk, where there was almost no one living in those times. One of the oldest buildings of our town at present, the Old Tekel Tobacco Warehouse (Selçuk-Efes Town Archive Building) must have been built in those days for the purpose of storage of the tobacco and figs which were grown in the vicinity prior to their transfer to the Port of İzmir. Having attracted the attention of foreign researchers even before the construction of the railroad started, the ancient town of Ephesus started to attract foreign travellers once the station was inaugurated. A hotel building which was constructed so that the western tourists who came in those days to be able to find accommodation in that period has now been restored to its original by the Municipality of Selçuk. This building was named the Carpouza Café, after George KARPOUZA, who inaugurated the very first hotel ever known in Selçuk in 1873. In the nationalist movement of the Unionists in 1913, the name of Ayasuluk was changed to Selçuk. It is known that it was also named Akıncılar for a while. Selçuk was a small town under Kuşadası until 1943 in the Republic period. Having been made a township in 1957, Selçuk was taken from Aydın and annxed to İzmir. Thanks to the İzmir-Denizli highway which had a main road character in the 1950s and passed through the town, Selçuk further developed. The Municipality of Selçuk was made a first-stage municipality under the Metropolitan Municipality of İzmir as from 15th May 2008. It has 33.732 inhabitants together with its seven villages according to the 2007 census. When one looks west from the courtyard of the Church of St John situated on the Ayasuluk hill, one may see the coastal strip of Ephesus which has withdrawn some 9 km within nine thousand years and the plain which has replaced the sea today. One of the seven wonders of the ancient world, the Temple of Artemis is at a walking distance from downtown Selçuk. The Ephesus Museum, where part of the works unearthed in the course of the excavations which have been being carried out for approximately 113 years in the ancient town of Ephesus has a distinguished place in the centre of the town. The town keeps arousing admiration among the people for its unique heritage which was left to us by a population which reached two hundred fifty thousand in the 2nd century AD when the town enjoyed one of its brightest periods. Although approximately 20 percent of the ancient town of Ephesus has been excavated at the present time, it is an ancient site which is the largest one in terms of area, which may be visited all over the world, and the one which attracts the most visitors in our country. It was visited by approximately 1.700.000 people according to the figures of 2007. In the east of the Panayır hill on which Ephesus rests, one may visit the ancient site known as Eshab-ı Kehf (Seven Sleepers), which is mentioned in the Holy Bible and the Qor’an. One of the necropolises (cemeteries) of the ancient town of Ephesus, this area was particularly in use during the Christian era. In Selçuk, where one may encounter the traces of a rich historical and natural heritage at each and every corner, the Virgin Mary’s House is one of the most important places of visit. Jesus Christ entrusted his mother Virgin Mary to St John, who was his closest friend, before he was crucified. St John took Mary and brought her to Ephesus. He had her and her retinue settle in the House where she lived for many years and died. St John settled on the Ayasuluk hill. He both wrote the New Testament and also started to spread Christianity there. The Virgin Mary’s House is situated at the foot of Aladağ at an altitude of 410 meters 9 km from Selçuk. It was declared a centre of pilgrimage by Vatican. The Virgin Mary’s House was visited by the last three Popes: Pope Paul the Sixth (1967), Pope John Paul the Second (1979) and Pope Benedict the Sixteenth (2006) respectively. In the museum which is kept open all year round are displayed works most of which have been unearthed in the course of the excavations carried out in Ephesus and some which have been excavated in such ancient towns as Claros in the near vicinity. 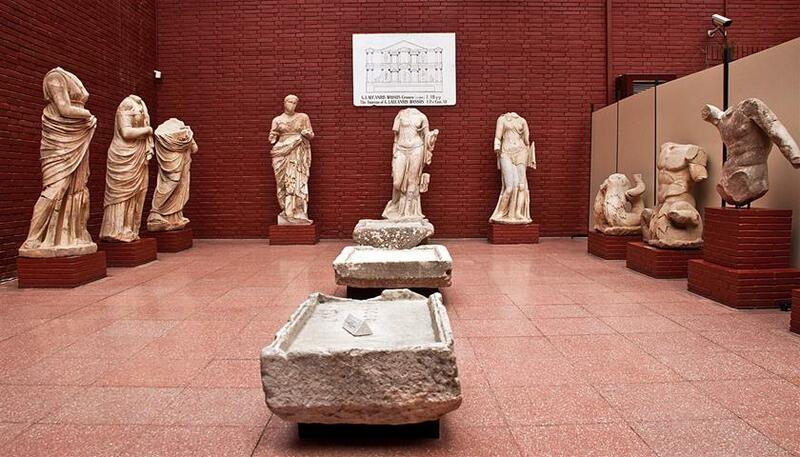 The Ephesus Museum is the most significant local museum of Turkey with the works it contains, the visitor capacity and cultural activities. The home where the Virgin Mary spent the last years of her life is a popular place of pilgrimage for Catholics. Located on top of Bulbul Mountain which on top of the hill from Atilla’s Getaway, it also gives the visitors a panoramic view over the town. According to Christian traditional beliefs this is the House that Virgin Mary lived her days after the Resurrection of Christ. She was brought to Ephesus by Apostle John. In 1812 there was a German nun by the name Sister Ann Catherine Emmerich who visualized the journey of Apostle John and Virgin Mary from Jerusalem to Ephesus. She described the house so vividly and it was recorded. The sister had never travelled anywhere else. The house of Virgin Mary is also sacred to Muslims, because the Muslims recognised Mary to be the mother of Prophet Jesus. The house became a Catholic shrine in 1896. Today many visitors from all over the world flock to the shrine. There is water which is being believed as a holy water and can be drunk by anyone. The spring water is believed to have healing properties. You can also put papers on the prayer wall and have a wish. 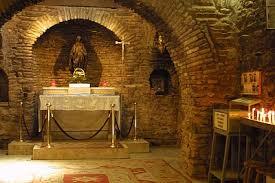 The House of Virgin Mary is a must visit. The second largest ancient city of the world. Explore the well-preserved ruins of Ephesus, the ancient capital of Roman Asia. The extensive ruins include the spectacular theatre, library and terraced houses. 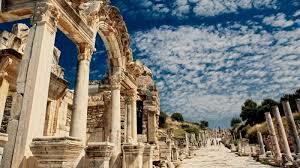 Ephesus was the major city of Asia Minor during the New Testament era. It was a major port – now silted up – located at the end of the spice and silk roads that ran west from Arabia and Asia. Paul visited the city on his second and third missionary journeys – staying there for about 3 years on his third journey. Ephesus is one of the seven churches mentioned in the book of Revelation (1:11; 2:1–7). It is mentioned 18 times in the New Testament. It was the center for the worship of Artemis (Roman Diana). The Austrians have been excavating there for over 100 years! Most of these artifacts are housed in the Ephesus Museum in Selcuk and it provides more information about the history of the area with many quality treasures on display. According to the old legends, Ephesus was founded by the female warriors known as the Amazons. The name of the city is thought to have been derived from APASAS, the name of a city in the KINGDOM OF ARZAWA meaning the city of the Mother Goddess. Ephesus was inhabited from the end of the Bronze Age onwards, but changed its location several times in the course of its long history in accordance with habits and requirements.